You should always try to learn new melodies that you can use in your solos. And in Jazz, Arpeggios are a great place to start. In this video I will go over 6 different types of 3-Note Arpeggios which are really useful because they are 3 notes, so they are easy to study and also very easy to use in solos giving you a lot of material that you can use when improvising over a song. 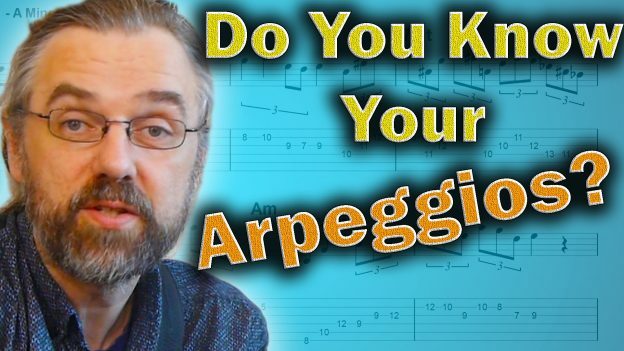 What a lot of people miss is that an arpeggio is really just a short melody. We think about what the notes are and what alterations and extensions it is over the chord, but you often forget to listen to it and just realize that knowing this arpeggio is really knowing a very strong melody that you can use in your solos. If you play jazz and especially more modern jazz then knowing these structures is really something you need as a part of your vocabulary and you will find it everywhere in the playing of people like Kurt Rosenwinkel, Jonathan Kreisberg and Lage Lund. The way I made this video is that I played a short solo on minor blues that I will take apart and talk about all the different arpeggios, give you some exercises and ideas on how to use it. 0:00 Intro – Arpeggios are Melodies! 16:02 Like the Video? Check out my Patreon Page! This entry was posted in Blog, News and tagged arpeggios, arpeggios guitar, arpeggios jazz, arpeggios jazz guitar, chord tones, guitar, how to improvise with arpeggios, how to play jazz arpeggios on guitar, jazz arpeggios, jazz arpeggios guitar, jazz arpeggios guitar tab, jazz guitar, jazz guitar arpeggios, Jens Larsen, quartal harmony, quintal harmony on November 26, 2018 by jens. Once you start having a vocabulary of Jazz Chords it becomes clear that there are many different ways to play any jazz chord on the guitar. For that reason it can be very useful to star working with different categories of chord voicings. If you have categories you have an idea of voicings that may work well together and you have an overview of the chords you know where you can also fill any gaps or chords you don’t already know. 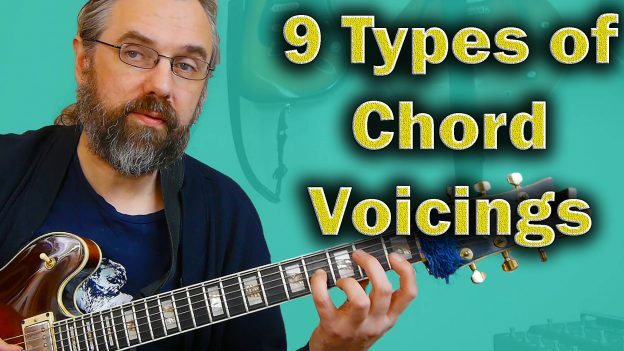 In this video I will go over 9 very common types of chord voicings that I use a lot when comping and playing chord melody. 14:10 Did I forget a type of voicing? 14:45 Like this video? Check out my Patreon Page! This entry was posted in Blog, News and tagged chord voicings, Comping, drop 2 voicings guitar, drop 3, Drop2, drop3, guitar, how to play jazz chords, interesting chords, jazz chords, jazz chords guitar, jazz guitar, jazz voicings, Jens Larsen, modern jazz chords, quartal harmony, rootless voicings, Spread Triads, voicing on December 18, 2017 by jens. It can be difficult to come up with new ideas for your solos, but this video talks about how you can use all of the diatonic triads, arpeggios, pentatonic scales etc and find the right ones to the chord you are playing over. Not only playing just with the arpeggio, but also how to mix it with the other material. 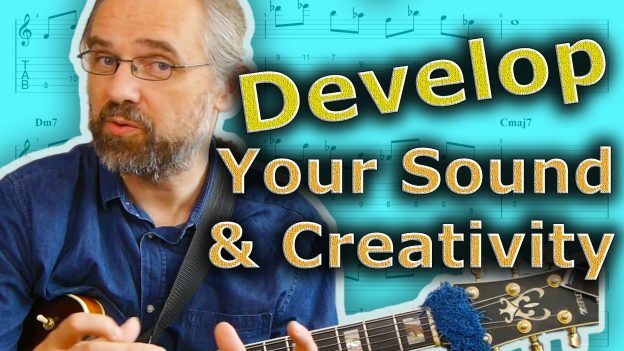 The video has a lot of examples and explanations and also a lot of philosphy on playing over changes, superimposing arpeggios and other things like developing a personal sound and taste. 11:01 Solo using C major triad 11:23 C major triad and not having the 3rd in the arpeggio. 19:37Other options like spread voicing, drop2 and inversions..
30:38 Difference between Sus4 and Quartal Harmony? 33:51 Using the resolution of the sus chord in the melody as well. 35:05 Sus4 triads as voicings. 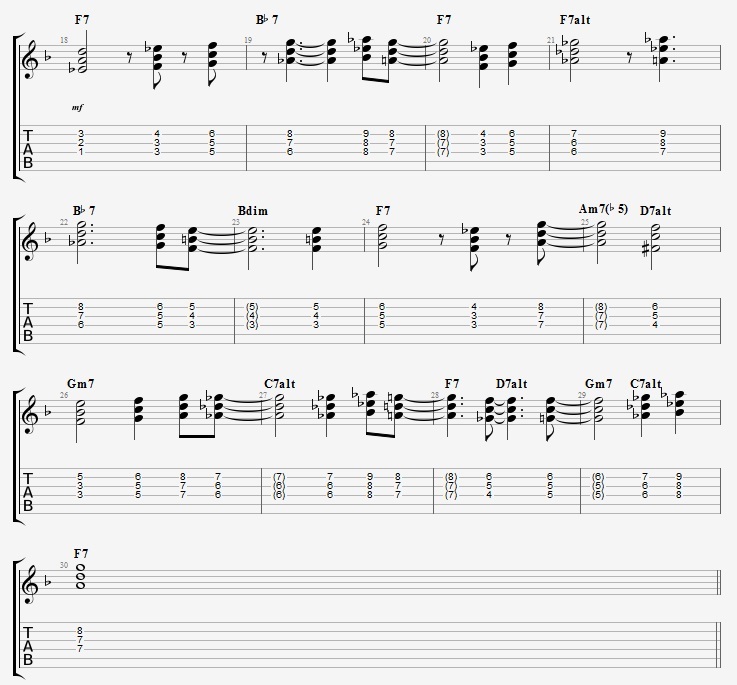 This entry was posted in Blog, News and tagged arpeggio, arpeggios, arpeggios over a jazz chord, diatonic arpeggios, diatonic triads, guitar, how to use arpeggios, jazz guitar, jazz guitar lesson, jazz guitar lessons, jazz guitar solo lesson, jazz lesson guitar, Jens Larsen, melodic playing, music theory, pentatonic, pentatonic scales, quartal arpeggio, quartal harmony, shell voicings as arpeggios, triad, triads, triads in jazz on September 6, 2017 by jens. 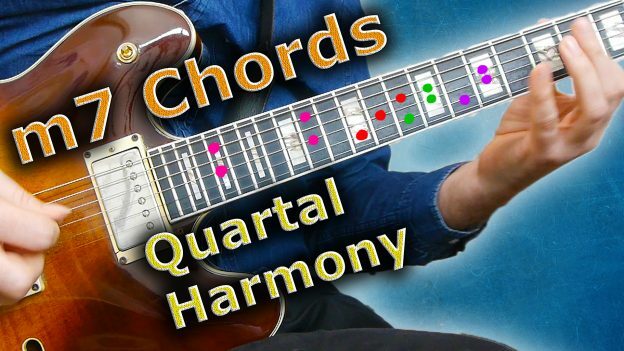 Using Quartal Harmony on the guitar is a great way to tap in to the modern jazz chords. In this video I am going to show you how you can use quartal voicings on guitar to get a more modern jazz blues. First going over all the voicings available for each of the chords in the blues chord progression. As a bonus I have also added a few extra turnarounds to explore and see how you might use this in a context with more moving harmony. 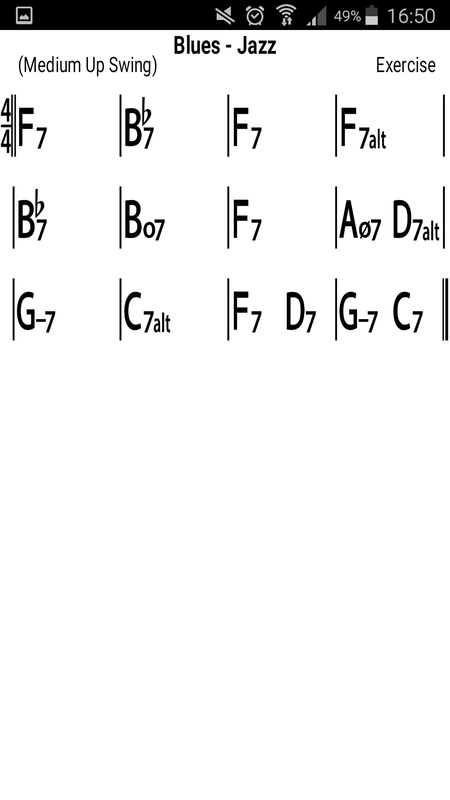 To get started using these chords on a blues in F we need a set of voicings for each of the chords. The F7 chords are found by harmonizing an F mixolydian or Bb major scale in 4ths. In the video I also demonstrate how this chords might sound as F voicings over an F pedal. The general idea is that not all the voicings are complete F7 voicings, but the picture you create by using several voicings will still convey the sound of the F7. The specific sound of these voicings is inn this case also important because the quartal voicings are in themselves a bit unclear. The next chord is the Bb7 in bar 2. You can construct the chords by harmonizing a Bb mixolydian or Eb major scale in 3 part stacks of 4ths. The F7 alt voicings are coming out of the F altered or Gb melodic minor scale. In this context the chords all include a lot of notes that are not in the F7 sound. This means that it is somehow easier to hear the F7alt, as you can probably hear in the video. The cadence in an F Jazz blues is a II V I in F: Gm7 C7 F. The voicings for the Gm7 are found by building stacks of 4ths in an F major scale. Note that again for the period where these voicings became common it also became much more common to play unclear II chords with a m13 voicing. Usually the II chord was there to suspend the V so the 13 could not be included. From McCoy Tyner and Herbie Hancock on it became quite common to play m13 voicings for the II chord. The dominant is an altered dominant, again to fit the style and sound associated with this sound. The 1 chorus example shown below is an F blues played entirely with Stacks of 4ths. The first chord is a stack of 4ths from Eb that you might recognize as an F13. This is a complete F dominant sound and we start by giving a complete picture of what is being played. From there the chords are walking up through the scale to the same type of chord voicing on Bb7. In the end of the Bb7 bar the voicing is also moving up step wise and this makes it possible to descend down to an F7 voicing chromatically. From that voicing the melody skips down to again walk up and approach an F7alt voicing. Note that the context makes this clear even though the voicing does not contain an A or an Eb. Via the F7#9 voicing we can move down a half step to get to the Bb7. With step wise descending movement the melody continues down to a Bdim voicing and repeats this voicing before resolving back up to an F7 voicing. The melody of the F7 and the Am7(b5) are really using the same set of voicings. On the D7alt the chord is an D7(#9) voicing. Gm7 is played with a Gm13 voicing and the melody can again move up in a step wise motion to reach the C7alt chord. On the C7alt, the chords are encircling the F7 voicing that it resolves to in bar 11. The turnaround uses this voicing and the D7(#9) voicing, The Gm7 voicing is in fact more of a Gsus4 or Dm7 type voicing but in the context it comes across as a Gm and it makes it possible to move up to the C7 voicings with an ascending half step. As in the cadence the two C7 alt voicings encircle the final F voicing. I decided that it might be useful to demonstrate how more dense progressions sound if you go through them only using the quartal voicings. The first example is starting out in the same way the last part of the blues did. From the D7(#9) voicing I use a vocing that i can move up a whole step to get a Gm13 voicing on the II chord. In this turnaround the C7alt is first a clear C7(#9) and then a stack of 4ths that only contains alterations. Thes alterations can then be resolved a half step down to F7 and I end on the F13 voicing. In the 2nd turnaround I am now starting on the same F7 but then moving up stepwise on the D7alt. By moving up further it lands on a complete Gm7(11) voicing. The C7alt voicings are also just moving up in scale steps. The line ends with the same voicings of turnaround 1 but an octave higher. The last turnaround is again starting with the same F6/9 voicing as the previous versions. The D7 alt voicings are now reached by moving to the closest voicing below the F chord. From here the melody continues in steps dwon to Gm13 and continues to the closest C7alt voicings before it resolves to F13. As you can hear in the examples there is a very charateristic sound to the quartal voicings. When using them in the way that I am doing on the blues in F in this lesson it works really well even if all voicings are complete. The way you want to work on this is probably to work on your diatonic stacks of 4ths. Then try to comp through progressions you are very familiar. Since you know them you can tell if the solutions you come up with are working in the context. This entry was posted in Blog, Lesson and tagged how to use quartal harmony, how to use stacks of 4ths, Jazz Blues, jazz blues chords, jazz blues in f, jazz chords, McCoy Tyner on Guitar, modern jazz blues, modern jazz chords, quartal harmony, quartal harmony guitar, stack of fourths on June 8, 2017 by jens. As I promised in earlier lessons, here is my take on putting the chords I talked about in the 3 part quartal harmony lesson and the one on diatonic chords of the pentatonic scale to use in improvisation. In this lesson I want to demonstrate how I use it in solos by going through some technical exercises and some lines I wrote using quartal harmony. I am going to demonstrate a few exercises and then give you a few examples and of lines and how I constructed them. In this lesson I am only going to be concerned with the 3 note variation of these chords, since that is the one that is the easiest to put to use. All my lines and exercises are going to be related to a II Valt I in Bb so we need to check out the Bb major scale and the F7 altered / F# melodic minor scale before we start working on making lines. First let’s just talk a bit about what you might practice to prepare for making lines with stacks of 4ths arpeggios in them. Here are the chords for the Bb major scale on two sets of strings. I’d suggest you practice them both as chords and as arpeggios to get technically prepared for using them in improvisations. As you might already see we can’t really name the chords in the way we are used to with diatonic chords and triads. You chose them by looking at the notes they contain and how that relates to the chord you are playing them over. This can be a bit heavy if you are not used to think like that, but is actually a very useful skill for “the thinking improviser”. It will also help you to analyze transcriptions and identify what s being played. In my examples I chose the arpeggios for the Cm7 chord on the criteria that I don’t want it to contain an A, because I want to save that note for the F7. That is a choice, and not even a route that I always take myself, but for now it makes the lines easier to hear. Playing stacked 4ths requires a lot of string changing for the right hand which is a bit difficult and for the left hand you need to bar with different fingers to be able to play the them which can also be a bit demanding. Frank Gambale has a few good left hand exercises for this in one of his books. As for the right hand I generally alternate pick the arpeggios as you can see in the video, mostly because I like the sound of that sort of picking better than sweeps or economy when I play these arpeggios. Here are the chords for the F altered/F# melodic minor scale. I’d suggest you also try to arpegiate these chords and play F# melodic minor in diatonic stacks of 4ths in the way that I did it with the Bb major scale. If I break down the construction of the line it is an EbMaj7 shell voicings followed by an stack of 4ths beginning on G. Then on the F7alt I am playing the Coltrane 4 note pattern, and following that up with a stack of 4ths on the A in F#melodic minor. I resolve the high Ab to the major 7 of Bb. The 2nd example is first chaining to stack of 4th arpeggios on the Cm7, one from F and one from D. Then I play a sort of cliché F#m melody which is followed by an F#mMaj7 arpeggio that resolves to F the 5th of Bb major. The 3rd example is beginning with an Ebmajor 7th arpeggio that is then followed by a stack of 4ths from c. On the F7 altered I have made a melody using two stacks a whole step apart: one from Eb and on from Db. This pair is a useful tool when making lines and when playing chords in my experience. I start with a Cm9 arpeggio which I then follow with a stack of fourths played descending from C to D. This arpeggio I then can shift up a half step to fit it on the F7 chrod and then I lead that into an Ebm7 shell voicing which with a few notes from the scale is resolved to the 9 of the Bb. I hope that you liked the lesson. If you have any questions or comments then feel free to leave them here or on the video. Please subscribe to my YouTube channel and feel free to connect with me via Facebook, Instagram, Google+ or Twitter to keep up to date with new lessons, concerts and releases. This entry was posted in Blog, Lesson and tagged advanced, altered scale, arpeggios, composition, guitar, harmony, jazzguitar, Jens Larsen, lesson, melodic minor, quartal harmony, stacks of 4ths, Technical exercises, Video Lesson, YouTube on October 6, 2014 by jens. In this lesson I want to demonstrate how I use quartal harmony when I am playing in both modal and moving harmony. I also want to give some ways to practice these voicings and put them to use in those situations. What is Quartal harmony. The chords that w e use are for the most part derived from stacks of thirds as I described in these lessons: diatonic arpeggios, jazz chord essentials – triads. Quartal harmony is derived from stacks of 4ths giving other note groupings as seen in Example 1. Since we get different note groups but still want to use them in situations that we define from a stack of thirds (like a Cmaj7 or Dm7) We need to figure out how to apply them. The first thing to check out is the voicings themselves. Here is a harmonized major scale on the 2 top sets of strings. Once you can play them I suggest you try to play with them over a pedal, so that you have an idea of how each of those voicings sound in a modal context and you can start building up a vocabulary of melodies that you can play. In the beginning you can do this over the basic chords II V and I, but as a pedal so a vamp consisting of a Dm chord, on for G7 and one for Cmaj7, as I demonstrate in the video. For this scale it is also useful to check out how the voicings sound on a G7alt, Db lydian domininant or AbmMaj7 pedal point. In the video I break down each example a bit more and add some more info on how I made them and how I see them. This entry was posted in Blog, Lesson and tagged advanced, altered scale, arpeggios, chord voicings, chords, guitar, Guitars, improvising, jazz, jazzguitar, Jens Larsen, melodic minor, practice method, quartal, quartal harmony, stack of 4ths, Technical exercises, Theory, Video Lesson, YouTube on September 9, 2014 by jens.